Can Jakarta and Canberra Become Soulmates? Australia’s relationship with Indonesia needs to go beyond the successful management of incidents. To do this, it’s important to overcome trust deficits, taking steps that will bind rather than simply link the two countries. I hold very firmly to the view that the Indonesia-Australia relationship is critical to the future of both countries, certainly to Australia, and has greater potential to be a major, positive influence on regional affairs. I want to be part of the building of this relationship today and into the future. My position is shaped by my experiences in engaging with the senior leadership of the Indonesian National Armed Forces (TNI), the Australian Defence Force (ADF)-TNI alumni and relevant ministers from both countries over the period 2008-2014. 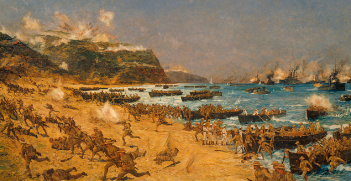 This was a memorable period in our relationship, but included in that period were some important advances in the defence relationship, for example, the establishment of the annual high level committee meetings between Indonesia’s panglima (commander) and Australia’s chief of defence force and their respective staffs, initiated by Admiral Agus Suhartono and continued by General Moeldoko. Of personal pleasure to me was the creation of IKAHAN—the TNI-ADF Alumni Association—a successful initiative to provide a means to keep ADF and TNI personnel in touch with each other. IKAHAN celebrates its seventh anniversary this year. What was evident to me during this period is that we need to develop additional means, be that formal or informal, to reduce the amplitude of the, hopefully now less frequent, disturbances between us. People-to-people links, of course, play a vital role when things go awry, but they need time when time may be short, when urgency is required, and they often lack the assurance that all interested parties are connected. This raises the important question for me as to what is the ‘stretch target’ for this bilateral relationship? But let me move from my personal experience and views to the theme of the 4th Indonesia-Australia Dialogue: ‘The Role of Civil Society in Strengthening the Indonesia-Australia Bilateral Relationship towards a Comprehensive Strategic Partnership’. As I read the record of proceedings from the third dialogue, I was impressed by the detailed list of recommendations to improve the bilateral relationship agreed to by each of the working groups. The thought occurred, how much more needs to be done? The answer to that question, unfortunately, might be that there is much to be done. If I take the simplest definition of civil society, a community of citizens linked by common interests and common activity, and consider it in regard to the findings of the Australia Indonesia Centre’s Perception Report 2016, there are strong indicators of where that work is required. The report begs the question as to whether civil society in both countries has a common interest in the relationship and the need to improve it. 19 per cent of Australians say that they have a good knowledge of Indonesia compared to 43 per cent of Indonesians of Australia. 47 per cent of Australians have an unfavourable perception of Indonesia compared to only 10 per cent of Indonesians having an unfavourable view of Australia. Of interest, 87 per cent of Indonesians view Australia favourably. 29 per cent of Australians agree that Indonesia is a good neighbour, compared to 66 per cent of Indonesians who see Australia as a good neighbour. 14 per cent of Australians see Indonesians as open-minded and only 13 per cent see Indonesians as trustworthy, compared to 73 per cent of Indonesians who see Australians as open-minded and 53 per cent see Australians as trustworthy. Thankfully for the dialogue’s theme, well over 60 per cent of Indonesians and Australians consider that their governments should seek closer ties. The survey indicates that from an Australian perspective at least, there is much to do to educate Australians about modern Indonesia. We can expect little support from Australia’s civil society for deeper ties with Indonesia if only 13 per cent view Indonesia as trustworthy, only 29 per cent see Indonesia as a good neighbour, and 47 per cent view Indonesia unfavourably. Who are we building a relationship with, Australians might ask? This situation also leaves both countries vulnerable to the manipulation of these sentiments during periods of disturbance. It is fertile ground for troublemakers. To use the ‘build a bridge’ analogy, we need to ensure that we have secure footings on each bank before we push out over the gap. The other key issue that comes to mind from the dialogue’s theme is: What would be the nature and characteristics of an Indonesia Australia Comprehensive Strategic Partnership? Elements of the key components of such a partnership are in place, albeit at differing levels of maturity: P2P links, defence and security cooperation, economic and trade cooperation, some shared strategic perspectives. In a statement that appears to move from what might be commonly deduced as the different priorities of each country in the relationship: Indonesia is primarily interested in economic development and cooperation, and Australia in security and defence. President Widodo, in his recent visit to Australia, stated his openness to a far more formal security and defence relationship, involving the revival of the Keating-era defence partnership and urging the establishment of the comprehensive economic partnership. If both of these initiatives came to fruition, could they provide formal mechanisms, such as bilateral institutions, to bind us closer together? Could the recent February 2018 Defence Cooperation Agreement be a springboard for even closer, continuous contact? Is there a place, for example, for a combined maritime security headquarters under this agreement and the Joint Declaration on Maritime Cooperation? Or would such formal mechanisms fly in the face of Indonesia’s historical ‘Free and Active’ foreign policy stance? I suppose, from my previous experiences, the key questions are: How close do we want to be, how close can we be, and what outcomes will bind us together not simply link us? 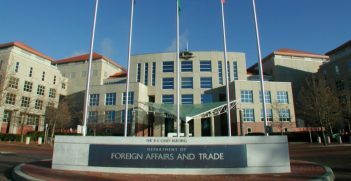 Dalam artikel terbaru di ‘Jakarta Post’, seorang mantan diplomat Indonesia di Australia, dan seorang teman baik saya, menggambarkan hubungan Indonesia – Australia sebagai Belahan Jiwa. In a recent article in the The Jakarta Post a former Indonesian diplomat in Australia, and a good friend of mine, described the Indonesia –Australia relationship as Belahan Jiwa or ‘soulmates’. In his supporting argument he gave a number of reasons why this was so: our geographic proximity; our early history of sea trade between South Sundanese and North Australia; Australian support for Indonesian independence post-World War II; and an increase in engagement between us with, for example, over 200 MOUs having been signed. Soulmates try to learn about and understand each other, evident in over one million Australian tourists travelling to Indonesia and 20,000 Indonesian students in Australia. This is an encouraging assessment of the state of our relationship, perhaps with a bit of gloss on it. But it does demonstrate the attitude to building our relationship that is needed at our senior leadership level. Hubungan kami perlu untuk melampaui keberhasilan pengelolaan insiden dengan salah satu tindakan yang mengalir dari kepentingan bersama, kepemimpinan koperasi di kawasan ini, dukungan untuk imperatif bersama dan inisiatif dan mengikat kepentingan ekonomi. Oleh karena itu penting untuk memastikan bahwa para pemimpin dan orang-orang kita memperoleh wawasan yang lebih baik apa yang memotivasi dan mendorong masing-masing negara. Our relationship needs to go beyond the successful management of incidents to one of action flowing from shared interests, cooperative leadership within the region, support for shared imperatives and initiatives, and binding economic interests. It is therefore important to ensure that our leaders and people gain a better insight into what motivates and drives each country. His Excellency General The Honourable David Hurley AC DSC (Ret’d), is the 38th Governor of New South Wales. He commenced his five-year tenure in October 2014. Prior to his appointment as governor, he served for 42 years in the Australian Army, concluding his service as the chief of the defence force. 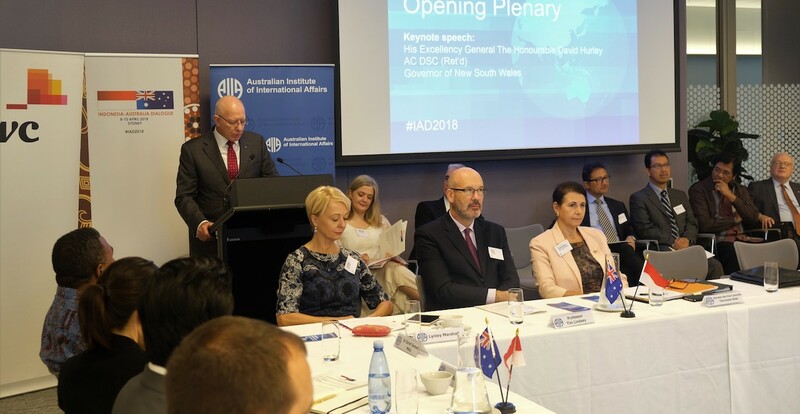 This is an edited version of a speech delivered on 9 April at the 4th Indonesia-Australia Dialogue organised by the Australian Institute of International Affairs with the support of the Department of Foreign Affairs and Trade, Indonesian Ministry of Foreign Affairs and PwC. 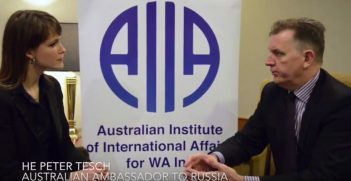 Among the policy divergences, Russia and Australia’s trading relationship continues to show opportunities for growth.